Having had Sheffield audiences in stitches, One Monkey Don’t Stop No Show is heading to London. 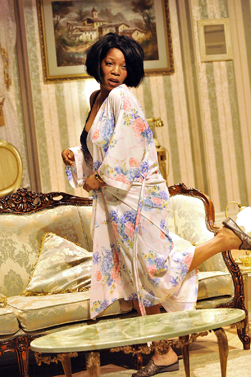 Afridiziak Theatre News caught up with the show’s leading lady, Jocelyn Jee Esien to get the low down. A UK premiere, One Monkey Don’t Stop No Show from acclaimed company Eclipse Theatre is a co-production with Sheffield Theatres and an uproarious family drama where The Cosby Show meets Restoration humour in an intoxicating blend of riotous comic elements. Recreating a 70s sit com feel, the set replicates the sights and sounds of a live television recording with authentic TV monitor effects and on-air lights. This production of One Monkey Don’t Stop No Show is the UK première of Don Evans’ classic comedy. Evans (1938 – 2006) was an American playwright, director, actor and teacher and a founding member of the ground-breaking Black Arts movement of the 1960s and 1970s. He wrote 18 plays which have been staged across the US and Europe. His writing was hugely influential to the development of US TV Sitcoms such as The Cosby Show. 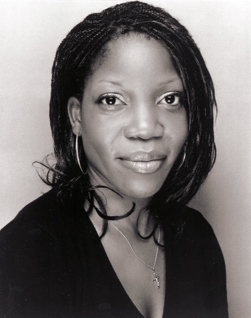 Award-winning comedian and actor Jocelyn Jee Esien stars as matriarch Myra. Jocelyn was the first black female comedian to write and star in her own BBC TV series, Little Miss Jocelyn. Her other credits include the comedy series 3 Non Blondes, recent British film Anuvahood and the Chichester Festival Theatre production of Racing Demon. One Monkey Don’t Stop No Show, what does this mean? It’s a phrase used to explain that the show will go on; because the word monkey is in there, people are often surprised. It could be anything, it could be one cat don’t stop no show. It basically means the show must go on. What message is this play trying to give out? There are lots of different messages in there subliminally, there are messages of love, and issues about race and cast, but the play does have a happy ending. We touch on issues, which kind of get a lot of questions answered, ending on a high note. How does this show differ from other shows you’ve done? Some of the shows are different because they have their own nuances and some similarities; I’ve never played the lead of a sitcom so it’s a huge and dramatic piece. It has drama in there as much as comedy and bit of romance. Were all discovering new things and I’m discovering more about my character, it feels like were performing in the 70s by the way we’re dressed and the way we speak. You can either relate because you were there, or it may remind you of a certain sitcom like The Cosby Show and The Fresh Prince of Bell Air. The actor, who played the character Felix, was the head writer of The Cosby Show and there are traces of characters like Uncle Phil and Doctor Huxtable, in there. Have you been to the US? Can you relate to the character Myra? Yes I’ve been to US but not Philadelphia, the places I have been to is New York and LA. We’re all recognising our selves in our parts, and elements of Myra that I see in myself is her having Obsessive Compulsive Disorder as I have a touch of that with cleaning, I’ve got an obsession with tidying up and constantly moving things on stage. The good thing about this play is there are issues that we’ve read about in Pride Magazine or The Voice or any one of the national newspapers. Things like dating and how we feel about black women dating black men, how black women feel about their hair, how other men feel about black women’s hair and what’s so amazing is that were still having these same discussions and arguments today. How would you describe the middle class lifestyle you portrayed in Philadelphia to the lifestyle you had growing up in Hackney? Oh my God completely different. The character Myra is somebody who has climbed the social and class ladder, but deep down she’s still the working class Myra who grew up in a household with 20 brothers and sisters. Everything in her life is fake, she gets lots of words wrong and completely surrounds herself with white furniture; I don’t think we had any white furniture growing up. My mum would never have anything like that in the house because it would just get destroyed. How do you feel about “Little Miss Jocelyn” making television history in the UK and US? I am proud, we only found out after we had filmed it, once the show progressed they tried to compare me to other shows and it was then that we realised, that it had never been done before. At first I felt uncomfortable but now I can look back in hindsight and accept it now. Sometimes we don’t pat ourselves on the back. My friends were like take it man! I’ll take it now, I’ll take it and now I keep mentioning it to people, and they say to me to shut up. 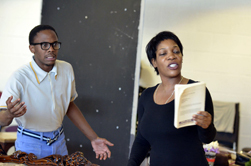 In AnuvaHood you played Tasha, where did you draw your inspirations from for that character? I just reverted back to Jocelyn at the age of 19, the minute I put on my velour tracksuit, yeah – that was me. Got my hair pulled back, some leggings on underneath, one leg up one leg down, trainers, big rings, bigger earrings. A lot of things I was wearing were things I used to wear already, that were just old Jocelyn. I was a rude girl; well I thought I was a rude girl. Since I started working October has been my busiest month, not just for comedy but for black performers and that’s when were called out. It’s great to be acknowledged but I think it should be all year round and to keep that momentum going into the next year. I’m still learning about black history and it’s so important to have it as a constant throughout the year and still keep October as the big one.